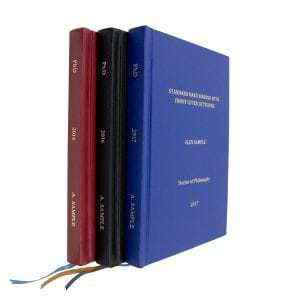 We have detailed information on our Thesis Binding Service here. You can click on the for more info whilst completing the form. There are up to 6 steps, depending on the options you choose. First, you specify the number of copies of the bound Thesis or Dissertation you require. If you require 1 hard-bound and 1 velo-bound copy, you would enter 2 in the Number of Copies box. The majority of our customers require printing, so the form defaults to this. If you are printing the document your self, please tick the box stating that you do not require printing and provide the information requested. If you do require printing, please let us know the number of Black and White pages in a single copy of the book, and the number of colour pages. The form will automatically calculate the total cost based on the number of copies. For example, if your document is 200 pages of black and white you would enter 200 in the Black and White Printing Quantity field. Do not double the number of pages if you ordered more than one copy, we do this calculation for you. We offer a PDF checking service to make sure that your document will print perfectly for the binding. Let us know if you have any pages you want us to specifically check (5 maximum). Firstly pick the turn-around time. This tells us how urgently you need your binding completed. Then let us know how many of each binding type you require. So if you wanted one hard binding and one velo, you would enter 1 into the relevant fields. We offer a selection of extras that can be added to your bound books. You can leave the fields blank if you do not require anything or specify how many you would like of each in the relevant fields. Here you can pick the cover colour for your hard and soft bindings. You can either pick by University or by colour. This allows you to select a prefered colour for your own personal copy if you wish! This allows you to specify the lettering details for your hard and soft binding. Simply complete the fields. Let us know if you want us to ship the finished books to you or if you will collect them. We offer FREE shipping to many London Universities or you can specify any address you like. You can also specify multiple addresses if you ordered more than one copy too. We can take photos of your finished Thesis / Dissertation before we ship it. This is ideal if you have the book shipped straight to the University and you never see it. You can also provide any extra information about your order and upload your finished PDF file. If the file is over 50mb, please use the private yousendit link. The final step is payment. We take debit/credit cards via our secure payment providers (Payzone and Paypal). This means that your card details are 100% safe and do not get stored on our servers. In fact, we do not even see your card details! You can also pay on collection if you opted to collect your finished product. We use Xerox digital printers for our thesis/dissertation printing. Our printers produce high quality text and graphics with crisp vivid colours and will give your thesis a professional look and feel. Our standard paper is a high quality 100gm white paper which is suitable for text and graphics equally. Please be aware, pages with ANY colour will count as and be charged as a colour page. This will include hyperlinks if they are still in blue on the PDF and can often include light greys (if not set up to be B/W) and/ or scanned images. Please check your PDF to avoid any unexpected charges. Colour Printing - Please be aware, pages with ANY colour will count as and be charged as a colour page. Number of sides to be Printed per copy. Enter 0 if no Black and White sides required. Number of sides to be Printed per copy. Enter 0 if no Colour sides required. We can print on both sides of the paper if needed, please note that the vast majority of universities specify single sided print only. Please check your thesis will be accepted with double sided printing before choosing this option. Check the file and ensure the margins are set and will work with your selected Thesis Binding. Send you an updated copy for approval PRIOR to printing if any changes are made. Please list the page numbers you would like us to specifically check. You have not specified any number of pages to print. 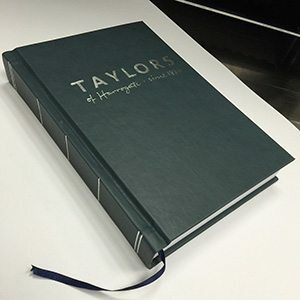 Your university or college will usually provide you with a binding specification but generally the binding style will fall into one of two categories- hard binding or soft binding, this is not always clear so please have a look at the bindings we offer to best suit your university requirements. You will find info about the different bindings within the order form by clicking on the (? )’s next to that particular binding. We can print and bind your thesis on the same day, if we receive your order by 10.30am it will be ready for collection or dispatch at 3.30pm that day. We need to receive your order by 10.30am for it to be counted as a working day, for example if you order a 3 day service before 10.30am on Monday it would be ready Wednesday afternoon at 3.30pm if you had ordered the 2 day service it would be ready Tuesday at 3.30pm. Please enter how fast you need your finished Thesis? Please note this excludes delivery if applicable and that turnaround times effect binding costs. You must specify a turn-around time. The number of Bindings ordered does not match the number of copies specified on the first page. Please update before proceeding. Self adhesive CD pocket which can be left loose or placed within your book, Generally we stick it to the inside of the back cover but you can specify special instructions in the additional notes at the end of this order form. We can copy your file on to a CD for you, we also provide a plastic pocket which can be inserted in to your binding or left loose. Please specify instructions in additional notes at the end of this order form. Self adhesive Corner pocket for loose inserts, this can be left loose or placed within your book, Generally we stick it to the inside of the back cover but you can specify special instructions in the additional notes at the end of this order form. A cloth ribbon bound into the book used as a bookmark. We can copy your file/s on to a DVD for you, we also provide a plastic pocket which can be inserted in to your binding or left loose. Please specify instructions in additional notes at the end of this order form. We can copy your file/s on to a 4Gb Credit Card USB for you, we also provide a plastic pocket which can be inserted in to your binding or left loose. Please specify instructions in additional notes at the end of this order form. We can bind to any university regulation, if your university is not on the list please select other, you will then be given the choice to select the colour of your cover. Please contact us if you have any concerns. If you have any special requirements that are not on the list please contact info@document-centre.co.uk. We have many universities listed if you do not see your university on the list please select other and choose a colour. You also need to provide lettering details for spine and/or front cover, degree, year of submission etc... If you are unsure please give us a call and a member of staff will be happy to help. Tip: Use your browser search (normally CTRL+F or CMD+F) to find your university or colour. We foil emboss your book covers with a gold or silver foil to your university specification. Some universities require spine lettering only but others require your hard binding to have lettering on the front cover also. This would usually be specified on the binding requirements provided by your university. If you are not sure please call and we should be able to advise you. Spine lettering is the wording on to the side/spine of the book cover. Generally, you have your degree, year and name only E.g. PhD 2012 Bloggs J. Do you require Spine Lettering? We will use the information from your title page. We will photograph your Thesis books before shipping them. We will include a photo of the front cover, spine and positioned on a shelf. Please ensure you have converted your file to PDF and that you are happy for it to be printed. Please use this option to upload your file directly to us. For files larger than 50MB please use the free file transfer site below this upload box. Please ensure you state your order number which you will receive on completion of this order. If you are sending more than one file please number them in the order to be printed. *Please note, delays in receiving your file may result in your order being delayed. Please contact us if you are having problems. If you are happy with your order, please press Pay Now below. You will be asked for your contact and payment information.